Fear of intimacy, AIDS, bodily contact and exchange of fluids has led to our dependence on email and the internet where we can hide out and feel safe. (These ideas were discussed in the excellent movie "Me and You and Everyone We Know" by filmmaker Miranda July). "Save me from loneliness," we cry and our echo returns emptiness. Are we really more connected now? I see the internet as a new way of connecting - it is teaching us how energy works, similar to a soul reading, which for me involves reading a person's energy via distance - energy knows no time or space constraints - all time is now - we are all connected whether we know it or not. I paint to extend emotions outward into the universe as the emotions become larger and more meaningful - myth-making in process. 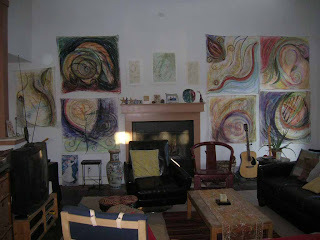 My new paintings are filling up the wall of my living room! Each generation creates it's own definition of beauty often tearing down the previous generation's definition in the process. I am part of Generation X: punk music, AIDS, the end of the Cold War - we ARE NOT Flower Children or hippies (the Boomer Generation) even if some of us are vegetarians. Our generation may appear 'dark' and aimless to the Boomers, but our reality growing up was dark. "I ain't no mystic baby and I ain't no whore, just a travellin' fool with a beautiful soul". From the album "PippinTravels" by PippinJoy. Musical Ambiance: "PippinTravels" - PippinJoy. Film Ambiance: "Me and You and Everyone We Know" - Miranda July.